Generally, cooking a sirloin in the oven is not as popular as cooking it on the grill, but when done properly, it can taste just as good. Searing the sirloin before baking it in the oven will ensure a succulent, mouthwatering meal. When the meat is seared, the seasoned outside of the sirloin is cooked to create a flavorful crust, locking the juices within the meat. 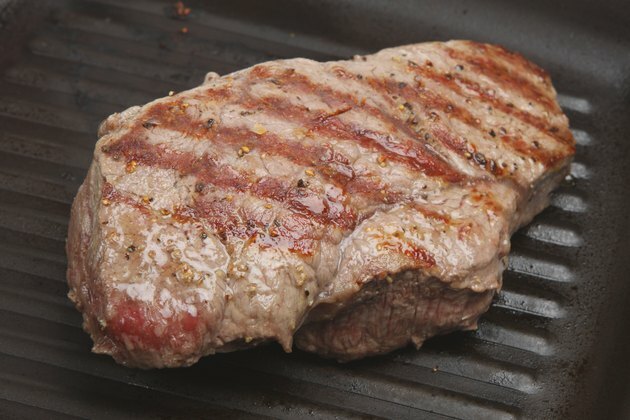 Finishing the cooking process in the oven is relatively simple, ensuring a tender, juicy sirloin. Remove the sirloin from the refrigerator and allow it to reach room temperature. Preheat your oven to 450 degrees Fahrenheit. Place a cast-iron skillet on the stove top and add enough oil to coat the bottom of the pan. Heat the oil over medium-high heat. Pat the sirloin with a paper towel to remove any excess moisture. Season the meat with salt and pepper, to taste, and any other spices or rubs of your choosing. Place the sirloin in the skillet and sear one side for three to four minutes. Flip the sirloin with tongs and sear the other side for another three minutes. Remove the cast-iron skillet with the sirloin from the stove top and place it on the middle rack in the oven. Bake the sirloin for five to 10 minutes. Remove the skillet from the oven when the internal temperature has reached 145 degrees Fahrenheit. Loosely wrap the sirloin in tin foil and let it rest for five minutes. The meat will continue to cook and the internal temperature will rise another five degrees.